Did you know that you can upload your hunting pictures to our new hunting photo library? 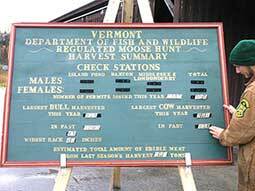 With an estimated 5,000 moose roaming Vermont, mostly in the Northeast Kingdom, and with an increasing number of moose collisions on highways, the State has once again licensed a group of men and a few women to hunt down the hapless creatures. About 600 were killed in October 2005, mostly in the Northeast Kingdom. One of the objectives of the hunt is wildlife management, another phrase for controlling population of a species by killing off a certain number of animals. Another objective of the hunt is money. Yes, the state of Vermont SELLS moose hunt lottery tickets, and SELLS licenses. It's a good source of revenue for a state constantly beset by financial woes. And then there are the owners of draught horses who are doing very nicely from the fees charged to haul dead moose out of the bush. See our video! The most effective means of population control seems to be collisions with automobiles, trucks and trains. There were more than 500 such collisions in 1998. In most cases the moose were killed. Occasionally, humans die too. See our moose collision page! Of course, moose hunting is a way of life for some people, just like it is for other hunts, such as the Newfoundland Seal Hunt. Many urban dwellers have some difficulty comprehending it. People involved in the hunt talk about stalking, of waiting for that supreme moment when their prey falls within the sites of their high powered rifle. They talk about the power and deadliness of their weapons and ammunition, and also the satisfaction of seeing a magnificent bull stagger to the ground, writhing in a moment of death. After all, it's part of life and death, it's sportsmanship and it's killing for food which anyone who eats meat must accept. And indeed, why should Vermonters have to buy their food (usually riddled with pesticide) from Florida or California when the local environment can supply something less tainted? Taking time off from work to attend the mandatory preparatory class, taking time off for the actual hunt. Lost wages $500 to $1,000. Finally, there is the cost of your celebratory party! Open ended! 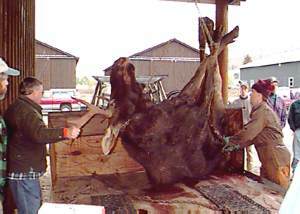 Total moose hunting cost................................................................................$2,000.00 to $2,500.00. Is the hunt the best way of controlling the moose population. Are states like Vermont and Maine doing the right thing? If you wish to comment visit the Moose Hunting Forum and say what you think!